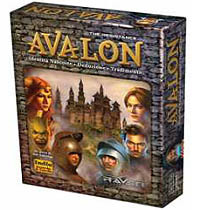 The Resistance: Avalon is the game of hidden loyalty. Players are either Loyal Servants of Arther fighting for Goodness and honor or aligned with the Evil ways of Mordred. Good wins the game by successfully completing three Quests. Evil wins if three Quests end in failure. Evil can also win by assassinating Merlin at game's end or if a Quest cannot be undertaken. Players may make any claims during the game, at any point in the game. Discussion, deception, accusation, and logical deducation are all equally important in order for Good to prevail or Evil to rule the day. Character Cards - Determin the player's loyalty . Character cards on the side of Good have Arthur's sigil on blue background and Evil have Mordred's sigil on red background. Hearafter references to a player's Good or Evil loyalty are denoted with a special front. 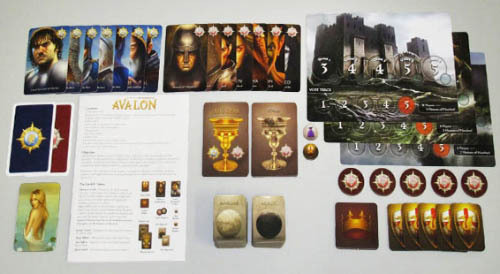 Some characters have special powers during the game - Merlin and the Assasin are included in all games and the remaining special character cards are optional. A player's character card may not be revealed at any point in the game, nor the character art discussed. Leader Token - Designates the player that will propose the Quest Team. Team Tokens - Allocate positions on the Quest Team. Vote Tokens - Approve or reject the Leader's proposed Quest Team. Quest Cards - Determine a Quest's success or failure. Select the tableau corresponding to the number of players. Place the tableau in the center of the play area with the Score Markers, Team tokens, and Quest cards adjacent to the tableau. Place the Round markers on the tableau's 1st Quest space. Given each player a set of two vote tokens. Randomly select a Leader; the Leader receives the leader token. Use the chart below to determine the number of Good and Evil players. Suffle the appropriate number of Good character cards and Evil character cards. One of the Good character cards will be the Merlin card, all the others will be just "loyal servant of Arthur's cards). One of the evil character cards will be the Assassin card, all the others will be just "minion of Mordred" cards. Deal one card to each player face down. Each player secretly looks at their assigned loyalty on their character card. True Evil is rampant in the land. Arthur represents the future of Britain, a promise of prosperity and honor, yet hidden among his brave warriors are Mordred's unscrupulous miniona. The forces of Evil are few in number but have knowledge of each other and remain hidden from all but one of Arthur's servants. Merlin alone knows the agents of Evil, but he must speak of his only in riddles.If his true identity is discovered all will be lost. Everyone close your eyes and extend your hand info a fist in front of you. Minions of Mordred open your eyes and look around so that you know all agents of Evil. Minions of Mordred close your eyes. All players should have their eyes closed and hands in a fist in front of them. Minions of Mordred - extend your thumb so that Merlin will know of you. Merlin, open your eyes and see the agents of evil. The game consists of several rounds; each round has a team building phase and a Quest phase. In the team building phase the leader proposes a team to complete a Quest - all the players will either approve the proposed team and move to the quest phase, or reject the proposed team passing leadership to the next player and repeating the process until a team is approved. In the Quest phase those players selected to be on the team will determine if the Quest is succesfull. It is a time for great decisions and strong leaders. 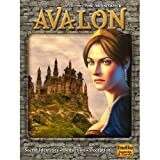 Not all knights and ladies of Avalon are loyal to Arthur, and yet you must choose only those that are Good to represent him in his quests. If an open ear and eye is kept, Merlin's sage advice can be discerned as whispers of truth. Team Assignment: After appropriate discussion, the leader takes the required number of Team tokens and assigns each team token to any player. The leader can be on the team, but is not required to be so. Note a player may only be assigned one team token. Discus, Discus, Discus. All the players should participate in helping the leader make the right choice of players to be on the team. Active and logical discusion is a great way to catch Mordred's agents in their webs of deceit. after appropriate discussion, the leader calsl for a vote on the team assignments. The leader is proposing the team - but all the players have a vote in wheter they accept or reject the proposal. 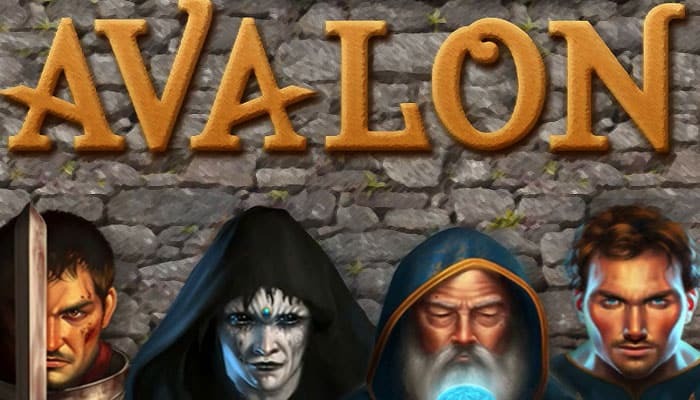 The leader can be evil, or one of the players chosen could be a mistake. Don't feel that you need to accept all the proposed teams. If you reject the team then a new leader can propose a different team, maybe one without any evil players on it. 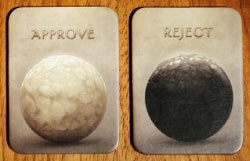 Each player, including the leader, secretly selects one vote card. When all players have their selected vote card ready, the leader asks for the votes to be revealed. All vote tokens are flipped over so everyone can see how you voted. The team is approved if the majority accepts. If the team is approved, play continues in the quest phase. If the team is rejected (a tied vote is also rejection), the leader passes clockwise and the team building phase is repeated. Evil wins the game if five teams are rejected in a single round. If you aren't confident of every one on the proposed team, then you should strongly consider rejecting the proposal. Rejecting a team is not a sign that you are evil. A group of skilled players will usually do the vote phase three of more times before agreeing to a team. Watch who approves, and ask them why they approved - sometimes Evil players will approve because they know another evil player was included. Merlin can also use his voting as a signal, but be careful the evil players will be watching. You have debated well and wisely chosen the brave knights and ladies with whom you place your trust. Now, it is time to measure a person's true intent and loyalty to the noble cause for which Arthur fights. Be true and goodness will prevail. The leader passes a set of Quest cards to each team member. Each player on the quest selects a quest card and plays it face down in from of themselves. The leader collects and shuffles the played quest cards before revealing. The quest is completed successfully only if all the cards revealed are success cards. The quest fails if one fail cards have been played. 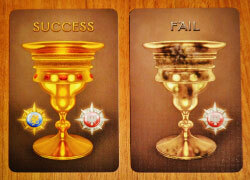 The good players must select the quest success card. Evil may select either the quest success or quest fail card. The 4th quest (and only the 4th quest) in games of 7 or more players requires at least wo Quest faile cards to be failed Quest. It's suggested that two different players shuffle the played and discared quest cards before revealing. it's best to designate a player not on the team to collect all the discarded Quest cards so that it's clear which cards are played and which are discarded. Shuffle the discarded quest cards. Indicate a successful quest on the tableau by placing blue score marker with arthur's sigil. 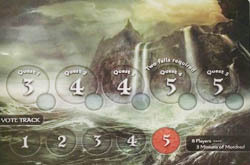 A failed quest is shown by placing a red score marker with Mordred's sigil on the tableau. After the quest has been completed, advance the round marker to the next quest space on the tableau. The leader passes clockwise and the next round begins in team building phase. Arthur and Goodness prevail if the team of Good is able to successfully complete three quests without revealing Merlin's true identity. Mordred's dark forces of Evil win when three quests end in failure or are devious enough to force Merlin into the open. The game ends immediately after either 3 succesful or three failed quests. The evil players win if 3 quests fail and when 5 teams are rejected in a single round. If 3 quests are completed succesfully, the evil players will have a final opportunity to win the game by correctly naming which of the good players is Merlin. Without revealing any character cards, the evil players discuss and the player with the assasin character card will name one good player as Merlin. If the named player is Merlin, then Evil players win. If the evil players do not name Merlin, then the Good players win. Four additional characters with special powers are available to play. You can play with these cards in any combination that you would like. Different combinations will make the game harder to win for one the side of the battle or the other. It's best to add one special character card into a game at a time, adding more or changing when you are familiar with how they play. In most cases, you will want to play with Merlin, but it's not required. Click here for more information about Percival, Mordred, Oberon and Morgana.